Politics 101: No matter how big the screwup, never apologize. Blame others, change the subject or as a last resort, beg forgiveness (still without explicitly admitting any mistakes, of course). Such was probably how the world worked in Babylon, 4,000 years back; it certainly was the rule in Santa Rosa, 1908. Another way to sidestep apologizing is not running for re-election, and every single incumbent city official decided that 1908 was a swell year to retire from public service. Left to not-apologize were party stalwarts, who faced an electorate irate over the City Council's decision the previous year to legalize prostitution in Santa Rosa without public notice or hearing. The "Good Ol' Boys" who had long controlled the town were at risk of an election upset to an ad-hoc party of reformers, so the Democratic and Republican parties joined forces to offer a "fusion" ticket against the slate of do-gooders. Leading the "Municipal League" party was Rolfe Thompson, a popular former DA who had recently won a lawsuit against prostitutes and their landlord.. Although the Dems and Repubs were offering the exact same candidates and their party platforms were identical in calling for a prompt repeal of the prostitution ordinance, the Democratic plank on this issue pleaded for the voter to understand they meant well, honest: "We earnestly recommend and favor the immediate repeal of the so-called boarding-house license, but do not impugn or question but that sincere and honest motives prompted and moved the framers thereof in legislating upon a difficult social problem." I have been charged with failure to eradicate prostitution in the city. I can't eradicate prostitution. No one else can. You know it. I know it. The Municipal League knows it. You can't eradicate prostitution until some power changes man's passions to purity. Heney of San Francisco, Foulke of Missouri, Deenan of Illinois and Jerome of New York have not been able to do it. There were other District Attorneys before me. They were not able to eradicate it. My predecessor in office. Mr. Thompson didn't do it. I don't remember his making any effort to do it. I prosecuted two cases and did as well as I knew how. No honest man who was present will say but that I did my best, although there are men going about the streets of Santa Rosa saying I didn't. Any man who says I did not do my best to convict that woman is a common, ordinary liar. I can make anything else out of it. The tenderloin district has existed in its present locality for 30 years and has never been regulated before, save by the power of some policeman's club. Except that due authority is now provided for exercising supervision and control, conditions have not been changed in the least. The boarding houses resolution licenses the sale of liquor, and that is all. But as with most of Finley's editorials during the 1908 campaign, he wasn't telling the truth. The ordinance did far more than just licensing booze; it licensed the bordellos themselves as legitimate businesses and established requirements that the names of the prostitutes be recorded and they be examined by a medical doctor every two weeks for sexual diseases. In short, Santa Rosa's City Council had legalized full Nevada-style prostitution. Voter anger over the prostitution ordinance was clearly the #1 issue in that city election, and blame shifting, evasions, and (non) apologies only go so far to mollify; to be assured of winning, the Good Ol' Boys needed to spring an "October surprise." On the very day of the election, the PD announced that fusion candidate for mayor James Gray had obtained options "on most of the property in that part of town and has a plan under way which if successful will not only remove the tenderloin district entirely outside the city limits but will result in beautifying all that portion of the city and transforming it into a public park." As the Press Democrat was a morning paper, the news would have reached voters just before they went to the polls, and there was no time for the other side to respond. 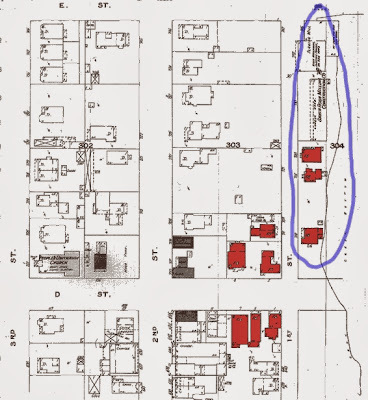 At least since the 1870s, Santa Rosa's tenderloin district was on First street, primarily between D and E streets (thanks to Mr. Finley for revealing the age in an editorial aside). The south side of First st. backed on to Santa Rosa Creek; not much was ever built on that side, and this bank of the Creek was a natural location for a water park, as first proposed a couple of years before. 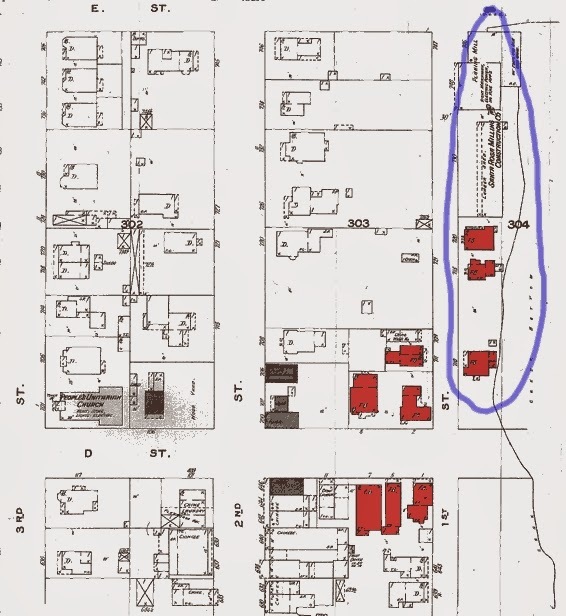 Gray's proposed urban renewal efforts specifically mentioned four properties were optioned. Two of them - the Santa Rosa Milling Co. and the Behmer house (the location of the infamous brothel) - we know were on the creek side of the street, so it's safe to assume that the other two lots were adjacent as well, as there were exactly four properties on that side (see 1908 map to right, with this area circled in blue). On the map, the houses of prostitution are colored in red. Thus Gray's plan would have removed only three out of nine known bordellos - and those were the smallest houses, at that. "While Mr. Thompson has been talking, Mr. Gray has been doing," Ernest Finley boasted in that election day editorial. Yes, that's true; too bad the PD hadn't published the news a few days/weeks/months earlier, so voters could have known that what Mr. Gray was doing was to propose building the town's only park adjacent to a consolidated and re-criminalized tenderloin district. Coverage of the election results and some of the aftermath follow in this series' final post. The meeting held last night under the auspices of the so-called Municipal League was well attended but it did not make any votes. In fact, after the meeting many express themselves as being of the opinion that instead of making votes it lost them. The arguments failed to convince, only a few of the "issues" that have been raised by the League's paper were referred to at all, and Mr. Thompson, who was the last speaker, found himself unable to hold the audience, hastily bringing his remarks to a close before he had concluded what he had to say, when he noticed what he took to be the beginning of a general exodus from the back of the hall. The campaign is of course now over, and the only thing up on the which the League has not fallen down completely in its position in reference to the social evil. Several of the speakers referred to the matter and it is apparent that this is the only thing left to their fight. But even this has gone by the board, and the men who are inclined to support the League ticket upon this ground will be making a sad mistake in voting for Mr. Thompson for they will be far more apt to get the results desired if Mr. Gray is elected than if the League candidate is placed in the chair. Although little has been said about it Mr. Gray has quietly secured options on most of the property in that part of town and has a plan under way which if successful will not only remove the tenderloin district entirely outside the city limits but will result in beautifying all that portion of the city and transforming it into a public park. Some of these options were secured several months ago, and they are now on file in the Chamber of Commerce. The properties bonded include that of the Santa Rosa Milling and Construction Company, Daniel Behmer, Cornelius Shea, Dr. J. J. Summerfield and others. The idea of transforming that part of the city into a public park is not a new one, but this is the first time anything like a systematic attempt has been made to carry the idea into effect. While Mr. Thompson has been talking, Mr. Gray has been doing. And so even the last remaining issue of the ill-starred and ill-advised Municipal League (so-called) falls to the ground. One would have to go a long way and search deep to find a political movement that has been so badly mismanaged and so absurdly handled as the "campaign" that has just been concluded here by the so-called Municipal league. Fathered by men who are in almost absolute ignorance of existing conditions, the long list of false issues were raised, only to be battered down one by the mere publication of a few facts. The falsity of the charges advanced has been in most instances publicly admitted by the League candidates and speakers. At last night's meeting, ex-Mayor Sweet paid a far higher tribute to the outgoing administration than any we have published, and from the stand at the Germania hall meeting Professor McMeans verified all we have said regarding the much-discussed boarding house resolution. Nobody now believes the defamatory charges that have been made regarding the city's moral atmosphere--that is nobody here. The story sent out and published far and wide may have of course found some credence, and it is practically impossible to offset their effect. We will live them down in time, but it will in all probability take years to convince the outside world that Santa Rosa is not as black and she has been painted. "The Municipal League" in its issue yesterday mentioned as truth an instance in which women had gone into a yard on Second street and when asked to refrain from picking flowers, had replied, "that they would not stop as they were licensed to do as they pleased in this town," adding: "Wait until after the election and we'll show you what an open town is." A lady, whose home is on Second street, recalled an incident similar to that referred to yesterday in "The Municipal League," and which undoubtedly was the one mentioned. She said that aside from the fact that the women were picking flowers the other part of the story reported was made out of whole cloth.